What is Oral-Assist Abscess Dr? How has Oral-Assist Abscess Dr helped others? How do I use Oral-Assist Abscess Dr? A tooth abscess is characterized by a collection of pus that develops as a result of a bacterial infection at the center of a tooth or the area between the gums and tooth. This is a common dental condition that is extremely painful. The collection of pus is made up of dead tissue, live and dead bacteria and white blood cells. If it accumulates in a small area and there is no place for the pus to drain, an abscess in formed. The more pus accumulates, the more pressure is increased and as a result the tooth abscess is excruciatingly painful. If the infection spreads and causes swelling in the face and lower jaw, the swollen area can rupture and the pus will drain out of the mouth. Although the pain may now stop, the infection is still there and treatment is required. If left untreated a tooth abscess can cause serious health complications such as tooth loss, sepsis, infection to the jaw bone and facial soft tissue and mediastinitis. Infection may also spread to other areas of the body and result in pneumonia, a brain abscess or endocarditis. There is a lot that can be done to keep teeth and gums healthy. Good oral hygiene can help to keep teeth and gums free of food and debris and regular dental checkups are highly recommended. If a tooth is broken or chipped, it should be filled or fixed quickly – as fractures or cracks in the enamel and dentin may form an opening into the pulp, leaving it vulnerable. Avoid foods that are sugar-laden and brush and floss teeth after each main meal. Natural remedies can also help to support healthy gums and teeth. In fact, natural remedies have been used in traditional medicine for thousands of years to support oral hygiene. 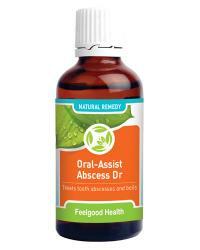 Oral-Assist Abscess Dr a 100% natural homeopathic remedy formulated for the relief of tooth abscesses and boils. Oral-Assist Abscess Dr can be used to safely support the structures of the tooth, gums and mouth, without harmful side effects. This remedy contains a selection of homeopathic remedies known for their ability to address common discomfort in a tooth or gum, such as acute throbbing pain and dull aching. Due to the concentrated tincture formula, Oral-Assist Abscess Dr Drops are absorbed into the system with ease – exactly when you need it! Acidum salicylicum 6C - Piercing pain is often addressed with this remedy, as well as sore, red and swollen gums – often accompanied by foul breath. Silicea D6 - used when there is a sensitivity to cold (in the mouth) and to promote bone health, beneficial in the jaw. Belladonna 30C - addresses throbbing pain and inflammation - is also given to children for teething pain. Merc sol 12C - is effective for a wide range of conditions that are accompanied by profuse, burning, strong-smelling secretions, and an associated sensitivity to heat and cold. Ferrum phos D6 - this remedy suits patients who suffer from symptoms accompanied by low energy with sudden shooting pain. Hepar sulph 12C - homeopathic remedy that suits boils that tend to produce pus. Oral-Assist Abscess Dr contains no gluten, artificial flavours, colours or preservatives. It is suitable for vegetarians and safe for all ages. Oral-Assist Abscess Dr is presented in a concentrated 50ml tincture formula, making it easy to take. Hold bottle upside down and administer 10 drops directly into the mouth. Alternatively dilute 10 drops in quarter cup water and sip slowly. Children under 12 years use 5 drops. Dosage may be repeated 3 - 5 times daily if needed until symptoms subside. May be used with Immunity Plus for ongoing immune system support. Consult your doctor if symptoms persist or worsen. Oral-Assist Abscess Dr supports the body on a cellular level – helping to support oral health and hygeine - from the first dose. Oral-Assist Abscess Dr contains homeopathic ingredients in a tincture formula that facilitates rapid absorption into the system – just when you need it! One bottle of Oral-Assist Abscess Dr will last approximately 30 days (depending on frequency of use). Remedy to assist oral abscess plus remedy to help reduce inflammation! Remedy to assist oral abscess plus immune system tonic! Remedy to help heal oral abscess plus fresh herbal breath spray! Remedy to address oral abscess plus internal healing tablets! Remedy to help assist oral abscess plus remedy to fight bad breath!